President Donald Trump and Vice President Mike Pence arrive at the U.S. Capitol to attend the weekly Republican Senate policy luncheon January 9, 2019 in Washington, DC. 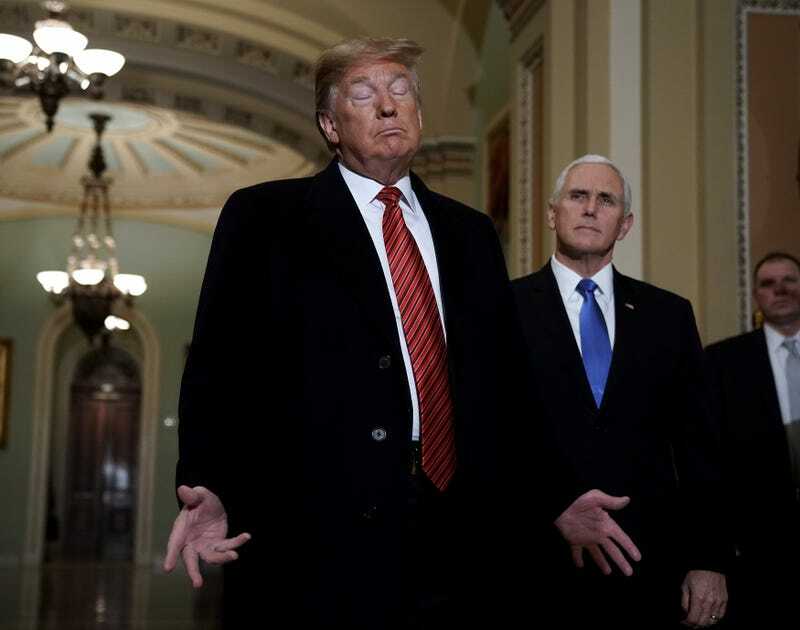 Trump is meeting with GOP lawmakers to shore up their resolve and support for his proposed border wall with Mexico as the partial federal government shutdown drags into a third week. Despite running on a campaign of how he was a master business deal-maker and touting that he was going to get a beautiful wall built to keep all the white people in America, now the president of people who wear shorts in winter is claiming he didn’t mean what he said. “When during the campaign, I would say ‘Mexico is going to pay for it,’ obviously, I never said this, and I never meant they’re gonna write out a check, I said they’re going to pay for it. They are,” he said as he prepared to visit the war-torn southern border of Texas, CNN reports. Well, Mr. President, you ran your entire presidential campaign on the promise that Mexico was going to pay for the wall. Once in office, and remember that Trump had a GOP-controlled Congress in his pocket, Trump never did anything to get the wall built. Now the mantra has switched from Mexico is going to pay for the wall to Mexico is going to reimburse America for the wall. The government has been shutdown as Trump holds some 800,000 American workers hostage as he fights to get funding for the wall that Mexico was never going to pay for. Everyone who didn’t vote for Trump knew Mexico was never going to pay for the wall, which has also now become some kind of steel slats or steel barrier, because the president is a liar. Meanwhile, 800,000 federal workers just called their utility providers and promised that Mexico was going to pay their electric bill.